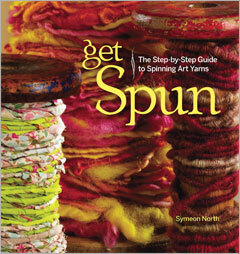 In Spin Off’s new e-newsletter, there is an article on plying with beads. Interesting, not because I need another hobby, but it’s just something that never occured to me. Spin your yarn, thread some beads on one of the singles or a thread, and then ply together with other singles to create your own “art yarn”. Cool! I’m going to have to try this, (because like you, I need another fun thing to do).